i recently spent a day at our local leisure centre participating in a scottish cycling, cycle leader course ultimately qualifying myself and three others to take new or learner cyclists over risk assessed routes around the principality. whether there is a pressing need locally for such a service is something of a moot point, but criticising from a distance without willing to be included in the sustainable transport initiative of which this forms a part, seemed at best, something of a cop out. though i'm most certainly not the world's fastest cyclist, i am quite confident in my abilities; if someone else can benefit from everything i've learned up to this point, so much the better. part of the discussion during the morning's theoretical part of the course concerned appropriate clothing for the activity of cycling, including just how brightly one ought to appear to other road users. i believe i'm correct in stating that recent research has all but proved so-called high visibility clothing to hold less of an advantage over regular and even dark colours than originally promised. this is not to say that appearing as a mobile christmas tree is not a good idea, just that, on a bright, shiny day, a black clad cyclist can stand out against his/her background every bit as much. it's what italian painters refer to as chiarascuro. 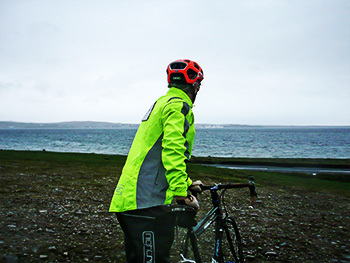 however, there really is nothing that a superbly fluorescent jacket such as the proviz nightrider can do against the errant mind of the less than observant motorist. this is something that was made plain on my very wet morning ride the day after the cycle leader course. having taken the opportunity to test the waterproofing of both the nightrider jacket and trousers, as i approached the left turn to debbie's at bridgend, a volkswagen estate was signalling to turn out from the car park onto the same section of road. i watched the driver check both his mirrors and visibly turn to look behind at my very bright approach, then calmly pull out in front of me. the distance between us was close enough that i had need of applying the brakes to avoid running into the back of his car. if nothing else, this underlines the fact that there may be more to contend with than simple visibility. the fact that proviz have dubbed this jacket and trouser pairing 'nightrider', gives something of a clue as to their intended roles in life, but i cannot deny that i partake of very little riding after dark. it's something that may be just as pertinent to many cycle commuters, particularly now that we've reputedly entered british summertime. it doesn't get dark on islay until well past 9pm, so unless you're a shift worker, nightriding may not feature in the day's commute. however, though i may not subscribe to the necessity of wearing fluorescent yellow when riding my bicycle, any means of highlighting personal visibility should be welcomed with open arms. but perhaps more importantly, allying waterproofing with hi-viz seems like a very good idea, given the drab greyness that inhabits many a rainy day. 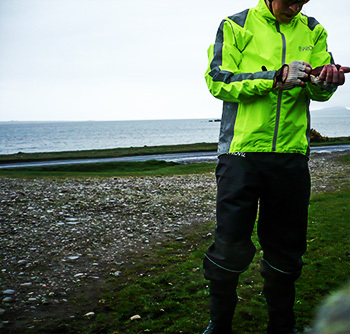 the proviz nightrider jacket is proportioned well enough to allow wearing over sensible clothes appropriate for the working day (such as the recently reviewed rapha lapelled jacket). in windy conditions (i have little choice in the matter) there is undoubtedly going to be flappage, but that's probably of less concern to the commuting cyclist than it is to the speedster. 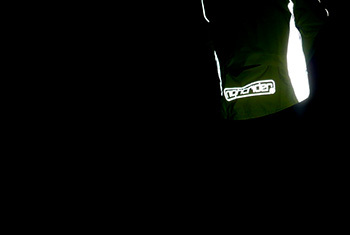 aside from the proviz logo on the front and rear, there are a couple of solid reflective panels on the shoulders, the full length of the sleeves and both side panels. 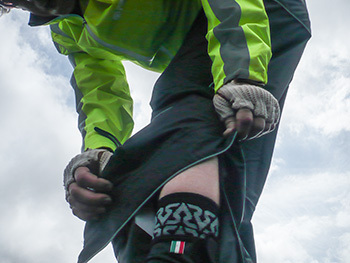 the cuffs bear a highly effective, adjustable velcro closure preventing any overheating or excessive cooling. apart from a small internal pocket, the nightrider jacket offers a full-width, all encompassing rear pocket concealed under a flap. you've no idea how grateful i was to find that this pocket swallowed those nightrider waterproof trousers when the weather cleared on the return ride. on the rear centre, slap bang between the shoulders, there's a sizeable reflective triangle velcro'd to the jacket. this can apparently be replaced with a usb lighting system if you fancy dazzling those following drivers. i can't stand waterproof trousers. that in itself isn't pertinent to the review in question, but i thought it better to get it out in the open. the proviz nightriders, however, seem to have taken into account pretty much every eventuality that could befall a prospective wearer. the waist is kept in place by means of a drawstring and the sizing will easily accommodate all manner of regular trouserwear. the clever stuff, however is at the shoe end; though offering more than adequate length, each leg conceals a poppered drop-down flap to cover a pair of standard shoes, though you may have to watch that spinning chainring. in order that the trousers might be put on or removed without divesting oneself of footwear, there is a zippered section covered by a velcro'd flap which works with perfected ease. additionally the outer edge of each leg sports a couple of velcro straps to pull the waterproof fabric into line, keeping it clear of the aforementioned spinning chainring. dressed thus in such commodious legwear, mrs washingmachinepost said i looked as if i was about to go motorcycling, underlining this thought with visible throttling motions. it's a look i cannot deny, though in order to allow for any frantic pedalling, a certain degree of bagginess is a necessity at the knees. granted, the sartorial elegance of the garment is modified when riding the bike, but it's definitely not an attractive look. however, in the case of commuting, substance does, i believe trump superficial style. 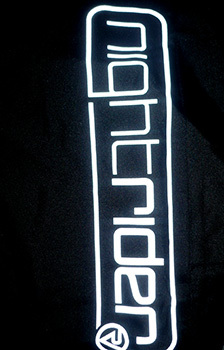 in keeping with their nightrider status, the trousers sport a sizeable reflective nightrider logo on each leg, along with other reflective detailing. clad in both jacket and trousers, volkswagen drivers at bridgend notwithstanding, you'd be hard to miss. both garments are labelled as waterproof and breathable, the very features my very wet saturday morning ride was designed to test. the jacket, even with its modest degree of flappage is a major boon in very wet conditions. the breathability was better than i'd hoped, while the waterpoofing was impeccable; not a dribble made it through. despite my protestations against waterproof trousers, the nightriders were more comfortable to ride in than their appearance had suggested. there were moments when standing up to ride a hill that they felt a mite restrictive (honestly) around the knee, but certainly nothing untoward. though the jacket proved itself more than worthy of approbation, there was a certain boil-in-the-bag feeling about the trousers, verified by a pair of damp trousers below on removal. granted, a portion of my 70km ride was in dry and warming conditions; only a desire to find the tipping point of breathability led me to keep them in place for so long. in other circumstances, i'd have removed them a lot earlier. many items of apparel profess breathability, but few ever manage to equate to the breathing engendered by the active cyclist. if commuting were a part of my daily travail, i'd be more than happy to clothe myself in the nightrider jacket. as i have already espoused, waterproof trousers are not my bedfellows, though if that hypothetical commute took regular place at night in wet and windy weather, i'd be happy to swallow my prejudice and keep myself dry. 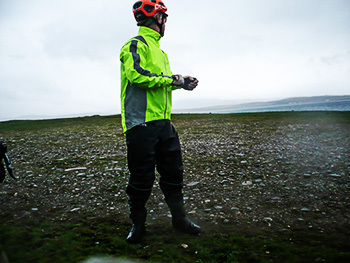 the proviz nightrider jacket is available in black, orange or yellow (reviewed) in sizes from small to xl at the remarkably equitable price of £59.99. the nightrider waterproof trousers, at a mere £39.99 can be purchased in black (reviewed) or yellow in sizes small to xl and 10, 12, 14, and 16.